Whether you spent 2016 celebrating the 100-year anniversary of the U.S. National Park Service or drove across country to visit a new grandchild, we hope you were able to put a few hundred miles of fun and adventure on your recreational vehicle. 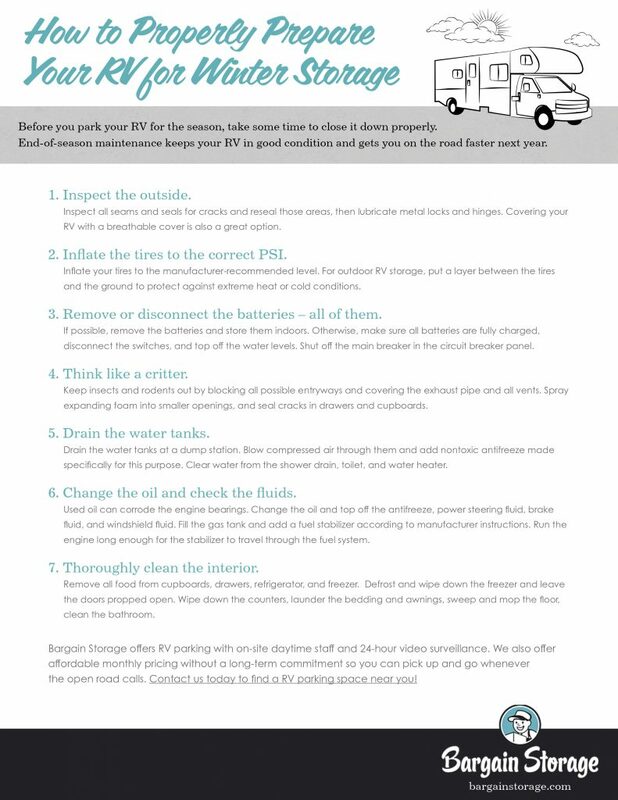 Before you park your RV for the season, take some time to close it down properly. It may seem like a lot of work, but if you spread the tasks over a few days, it becomes more manageable. Plus, if you do the work now, you will save yourself time and hassle next year when you’re eager to get on the road. Take a few minutes to inspect the exterior seams and seals. Look for cracks and other signs of wear and reseal those areas. Then lubricate metal parts, such as locks and hinges. Covering your RV with a breathable cover is also a good option. 2. Inflate the tires to the correct PSI. Even though you won’t be driving the RV for a while, it’s important to inflate your tires to the appropriate level. Some tire manufacturers, such as Goodyear, recommend adding 25% more air during storage, so check the website of your specific brand for guidance. If you store your RV outdoors, put something between it and the ground to protect the tires from extreme heat or cold conditions. Using blocks or outside jacks for each axel is ideal, but even cardboard is better than nothing. 3. Remove or disconnect the batteries – all of them. Phantom charges will drain your battery during storage. If you can, remove the batteries and store them indoors, especially if your RV will be stored in a cold climate. Otherwise, make sure all the batteries are fully charged, disconnect the switches, and top off the water levels. Shut off the main breaker in the circuit breaker panel and unplug anything inside the RV that can be unplugged. 4. Think like a critter. Insects and rodents of all sizes would love to settle into your RV while you’re not using it. Find and block all possible entries. Put a cover on larger openings, such as the exhaust pipe. Close and cover all vents, including those that are on the roof. Next, look for ways critters can sneak inside by following wires and plumbing to where they exit your RV. You can also wait until dark, turn on the inside lights, and look for light that shines through underneath. Spray expanding foam into the smaller openings you find. Remove all food, even if it’s stored in boxes, then seal cracks you find in drawers and cupboards. 5. Drain the water tanks. Forgetting to drain the water tanks is not a mistake you make twice – especially if it’s the wastewater tank. You can take care of this at the campsite during your last trip of the season or head to a local approved dump station once you are home. Make sure there’s no water in the shower drain, toilet, and water heater. Blow compressed air through the tanks and add nontoxic antifreeze made specifically for RV tank storage (not for your engine’s cooling system). 6. Change the oil and check the fluids. It seems strange to change the oil before storing your RV, but used oil can corrode the engine bearings. Service your RV with an oil change, then pop the hood and check all the fluids – antifreeze, power steering fluid, brake fluid, even windshield fluid – and top off anything that needs topped off. This will keep these liquids from freezing or drying out. Next, fill the gas tank and add a fuel stabilizer according to manufacturer instructions. Run the engine long enough for the stabilizer to travel through the fuel system. 7. Thoroughly clean the interior. Remove all food from the cupboards, drawers, refrigerator, and freezer. Defrost and wipe down the freezer and leave the doors propped open. Place an opened box of baking soda in the refrigerator to absorb any remaining odors. Use soapy water, a sponge, and a mop to scrub down the inside of your RV. Wipe down the counters, launder the bedding and awnings, sweep and mop the floor, clean the bathroom. 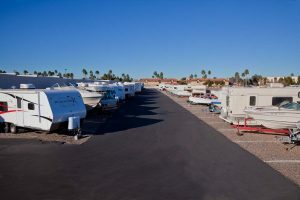 Once your RV is ready for storage, choose a safe place to park it. Bargain Storage offers long-term vehicle parking at several locations with on-site daytime staff and 24-hour video surveillance. We also offer affordable monthly pricing without a long-term commitment so you can pick up and go whenever the open road calls.